After suffering a first-round KO from Henry Lebron in July, Oscar Eduardo Quezada (6-4) went on to beat Ernesto Gutierrez (0-7-1) in September. Now Quezada is being used as an opponent for the Hector Tanajara (10-0), the San Antonio super featherweight who hopes to be Golden Boy Promotions newest star. Tanajara still needs some development, but he’s young and fast. And he is unbeaten for a reason. Tanajara is a boxer, not a brawler. He has a three-inch height advantage over Quezada, and we can expect him to use his jab to keep Quezada at a safe distance, as he has effectively done with opponents in the past. The fight between Jesus Serrano (17-4-2) and Genaro Gamez (6-0) should be much more exciting. 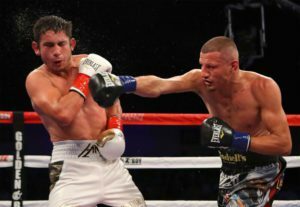 At first glance, Serrano may seem like the more experienced fighter on a downward slide, a journeyman sent in to fight a younger, up-and-coming fighter who needs some credible wins on his resume. However, the four losses and two draws on Serrano’s record happened earlier in his career and is on a nine-fight winning streak. He has also knocked out over half of his opponents. As for Gamez, he may have less professional experience, but he’s a dangerous fighter: of the six fights he has fought, four have ended in first round KOs. Both fighters like to keep their hands down. Expect a brawl. Ryan Garcia (11-0) vs. Cesar Valenzuela (14-5) is the fight on the undercard that you won’t want to miss. Valenzuela is a strong, more experienced opponent, but Garcia, who looks about twelve years old, has a knockout record that rivals Deontay Wilder’s. He’s sharp too, and when his punches connect (as they often do), the result is devastating. He was last seen in the ring in September when he knocked out Miguel Carrizoza with a powerful shot to the head that was so fast it was almost invisible. Jesus Soto Karass (28-12-4) wants to show the boxing world that he isn’t just another aging gatekeeper. He’ll get his chance this Thursday, Nov. 2 when he encounters Juan Carlos Abreu (19-3-1), the aggressive Dominican fighter who likes to taunt his opponents as he stalks them around the ring. Karass has beaten some decent talent, including Andre Berto. Recently, however, he’s lost more than he’s won. This fight may be his last chance to prove himself, and he’s sure to give everything he’s got. Hosted by Casino Del Sol in Tucson, Arizona, this 10-round main event will be aired at 11 PM (EST) on ESPN2. ESPN3 will stream the undercard fights starting at 9:30 PM (EST). Make sure to tune in early so that you don’t miss the fight between US Olympian Marlen Esparza (3-0) and Karla Valenzuela (3-16-3). It should be a one-sided affair, but Esparza is supremely talent and it will be fun to watch.